Thinking of buying (or leasing) a refurbished photocopier, but are unsure of how reliable it will be? Well here at Copy Print Services let us tell you what we know about refurbished copiers and hopefully help put some of those doubts to bed. These are machines that have already been used previously but still have plenty of useable life left in them. It could be that the machine was upgraded for a faster model or just that the lease had finished and a new device was installed. But just because these printers aren't new, definitely does not mean they should be discredited. So why choose a refurbished printer? When I could just buy (or lease) a new one? Good question. In fact there are a number of reasons why choosing a refurbished photocopier could be better than purchasing (or leasing) a brand new one. Let us shed some light on the positives of choosing a refurbished printer for your business. If you are the owner of a small business and your printing and copier needs are minimal, then why invest in a more expensive machine that has functions you might never find yourself of team members needing. A refurbished multifunction printer will do the job just as well as all the other printers that are possibly a bit more on the pricier side. While small businesses could benefit from purchasing (or leasing) a refurbished photocopier, the same could be said for those bigger businesses. We not only refurbish small photocopiers but in fact we refurbish printers of all sizes and functions, including large format printers. We will help you choose the best printer for your needs and this includes our refurbished photocopiers. We are all trying to make a more conscious effort to reduce waste and be kinder to our planet. By purchasing (or leasing) a refurbished printer you are giving an used printer that still has life in it a new purpose and helping to support the recycling of old photocopiers. These printers are going to cost you significantly less than a brand new one, saving your business money. So if you are trying to keep costs low then a refurbished photocopier is definitely something to think about. When buying a used machine has it been refurbished (i.e. fully stripped, cleaned, all consumable parts changed, latest software, check and test) or is it a used machine that has had a quick wipe over then sent back out? We guarantee at Copy Print Services that all of our photocopiers still have the best print quality, after going through a 35 step refurbishment process. we guarantee you can print/copy first time every time. Refurbished photocopiers are older but this doesn’t mean they were dug up from the stone age. All the technology on them is still very much recent and works to an excellent standard. We treat our refurbished photocopiers like we do all our printers, they get the same level of servicing. Here at Copy Print we dedicate our time to learning about your business needs in order to provide you with the best photocopier/printer that will be able to perform all that you need it to. This includes our refurbished ones, if you believe your business will benefit from purchasing (or leasing) a refurbished photocopier then we will ensure you get the right one. So that's our thoughts on refurbished photocopiers and the reasons why we think they could be the best option for your business. To touch lightly on the cons of purchasing (or leasing) any refurbished photocopier, the obvious being that they are slightly older and so are not as shiny and the technology will be a couple of years old. The other being that in theory they could last less time than a brand new photocopier. However we will guarantee the machine for 5 years! However we do everything we can to give these refurbished photocopiers a brand new lease of life. Like we said before all our refurbished photocopiers come with a 5 star platinum warranty in case you find yourself with any problems just get in touch and we will sort it out! To read more about our 5 Star Platinum Warranty click here. 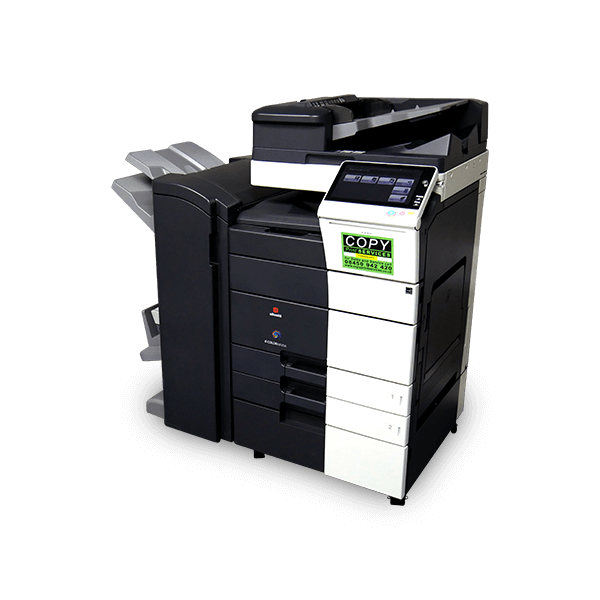 All our photocopiers/printers are treated with the same quality level of service and care. The same is said for our customers. We want to give you the very best deal and to create long standing relationships too! If you feel like you could really benefit from purchasing (or leasing) a refurbished photocopier then please get in touch! We’d love to hear from you and help! If you're wondering what the best way to fund your new photocopier, check out our post on to lease or buy a photocopier here.